A fierce struggle developed between the two towns for survival and bitter recrimination continued unabated with a government decision in 1882 for a railway survey. The 1880 discovery of a rich tin field at Herberton had initiated the request for a railway to the coast – Cairns and Port Douglas now locked horns in another round of fierce competition to be the coastal terminus. 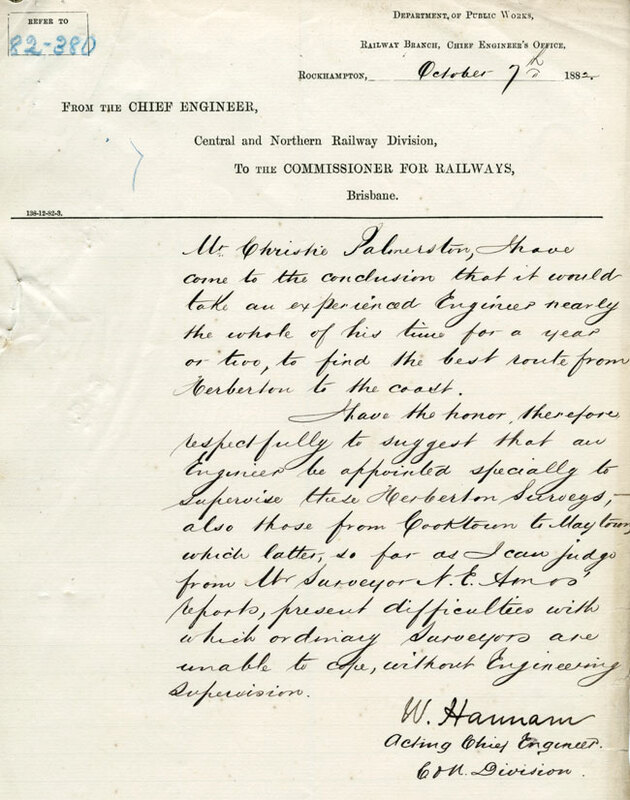 On some expeditions, including work to assist with the railway preliminaries, Palmerston was often accompanied by a young Aborigine named Pompo who Christy said he had “adopted” whilst exploring the headwaters of the Daintree River. Port Douglas residents suspected foul play on the part of the government towards favouring Cairns and denounced the railway department’s two separate surveys for their own town. After protracted lobbying the Douglas Divisional Board contracted a surveyor for an alternative trial line as far as Groves’ “Weatherboards” to meet the government survey near the present day Mt. Molloy. The privately funded work by Surveyor O. L. Amos followed a route which was claimed to involve less engineering and cost than that needed up the Barron River valley out of Cairns – all to no avail when the decision was announced in 1884 in favour of Cairns and confirmed by a Cabinet decision accepting the final Barron River route detail survey in 1885.